Welcome to day 1 of my Scotland Tour! It's been a gentle start to the trip and I haven't covered too many miles. Read on to find out why.. I set off from Ballybogey forest where I slept last night, at 6am, and headed into Larne to board the 7:15 ferry to Troon. Arriving at 9:20 on Scottish shores I followed the coast road up through Largs, and Skelmorlie, and soon found myself in Greenock. I'd covered more ground than I intended to in an hour or so; I was eager to get moving on the journey I imagine, but having planned to meet up with my cousin in Glasgow I wanted to stop somewhere along the way and pass the day resting after the early start, and look around wherever I was stopping along the way. 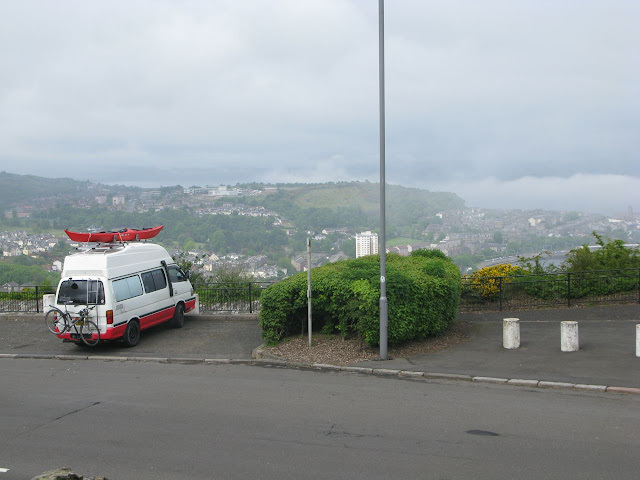 In Greenock I drove to the top of Lyle hill where I parked with a good but misty view if the lough and peninsulas beyond. I walked to the summit, then went back to the van and slept an hour or so, though its not easy to surrender to sleep when your setting out on day 1 of a trip and leaving your old life behind in another land.. I awoke to discover that the misty hilltop was awash in sunshine, and I was able to see distant mountain tops such as 'The Cobbler' about 20 miles away. I toasted some of the soda bread that Mark made yesterday, and spent some time admiring the view, then looking at the map, thinking ahead. Eager to move on I then drove another leg of the road to Glasgow and stopped just after Port Glasgow at Newark Castle. Here I spent a couple of hours fishing off a rickety old pier with a Chinese guy who was using big prawns as bait on his line, and also a wire basket of meat to catch crabs. Neither of us had any success, although I did see a large fish jumping right in the area into which I was casting! At 4pm I headed on into Glasgow and my iPhone did a reasonable job as a sat nav to guide me to my cousins apt. (Google maps app) it was weird though, driving through Scotland with an American accent guiding me and mispronouncing some of the place names. I did get there with ease though. It's really quite warm in the van tonight so I've moved my matress down to the lower bed to sleep comfortably and have more space too. Maybe I'll arrange things a bit differently tomorrow for the trip.. So.. In the morning heading off west again to get the Dundoon ferry and drive in the firection of the Isle of Mull..